NATO leads efforts to bring stability in its ongoing missions in the Balkans, Afghanistan, and Iraq. Legal Advisers serve as key members of a Commander‘s staff in the complex legal and political environment that NATO operates. The challenges NATO Commanders and legal adviser face to fulfil mandates, accomplish missions, and support the rule of law in embryonic and fragile democratic governments requires discussion, understanding and the documentation of practical solutions. The NATO Legal Deskbook is published by the Office of the Legal Adviser, Allied Command Transformation Staff Element Europe (Mons) with the active support and help of the Office of the Legal Adviser, Headquarters Allied Commander Transformation (HQ SACT, Norfolk, USA) and the Office of the Legal Adviser, Supreme Headquarters Allied Powers Europe (SHAPE, Mons, Belgium), as well as many legal advisers in NATO and in the Member States or in other official or academic positions outside NATO. 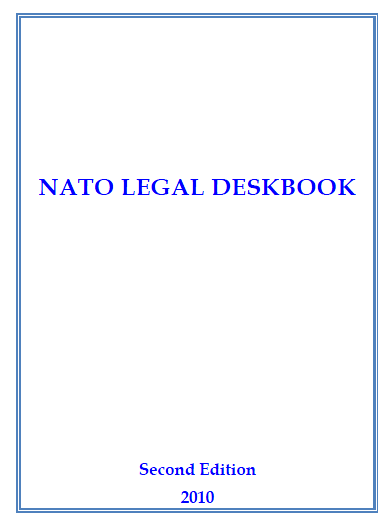 Why a NATO Legal Deskbook? Two re-occurring themes surface in after-action reports from exercises and operations. The first is that NATO Commanders and staffs naturally and increasingly turn to the Legal Advisers to help plan, execute, coordinate, evaluate, and support the assigned mission. The second is that no single doctrinal resource exists in NATO to assist legal practitioners in the fulfilling of this task. Although several Alliance members have produced such guides, before the NATO Legal Deskbook none existed for Legal Advisers and legal personnel assigned to NATO commands. Whether doctrinally ready or not, the Alliance calls upon NATO Legal Advisers and staffs to advise and, often, help direct the execution of the legal component of a mission or mandate. NATO owes these attorneys, paralegals, and legal personnel, who work under often austere and demanding conditions, practical guidance in the form of a comprehensive resource that provides an overview and insight on the legal regime that forms NATO practice. Fulfilling this need is the genesis, purpose and rational for this practitioner‘s guide. This Deskbook is not NATO policy or military doctrine for legal support to operations. The Deskbook intends to reflect as closely as possible the policies and practice of NATO in legal matters, however, the Deskbook is not a formally approved NATO document and therefore shall not be deemed as reflection of the official opinion or position of NATO. The practitioner‘s guide is not intended to offer guidance or advice to other military professionals involved in operations. It was written by Legal Advisers for Legal Advisers and legal staff. Its scope and purpose is limited to providing the military legal subject matter experts assistance in the accomplishment of the mission. While others may find the guide helpful, they should understand it is not a tutorial. Fundamental legal principles, standard practices of interpretation, and basic legal practices are assumed as matters already known by its intended audience: the Legal Adviser, legal assistant, or paralegal. This practitioner‘s guide does not offer an all-inclusive formula on how to advise a NATO commander on any particular aspect of the law, nor is it intended to supplant national guidance. Instead, the guide pre-supposes that Legal Advisers will continue to find themselves providing legal support to operations and missions in a variety of different circumstances, environments, and locations. The guide and its contents must therefore be flexible and geographically universal in application.